A couple weeks ago I went to see my daughter's junior roller derby bout at Oaks Park. 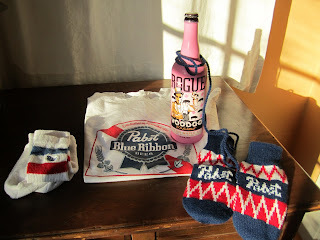 I bought some raffle tickets to support... well, not sure what it was supporting, but it must have been the grown-up roller derby and not the kids because the prize was a bag of Pabst swag: the T-shirt, socks, and mittens (!) in the picture, along with some other junk like koozies and stickers. Oh yeah, and a tube of New Belgium lip balm. Classy. The next weekend when the Beermongers held their charity glassware swap, I bought a raffle ticket, hoping to win the magnum of Stone Sublimely Self-Righteous CDA. Didn't win that, but I did win the pretty pink bottle of Rogue Voodoo Doughnut Bacon Maple beer. I had been wanting to try that, but I was unwilling to spring the $13 or $14 bucks it's going for. So it was nice to win. I was on such a streak that I could hardly believe it when I didn't win any of the old Celebrations in the raffle at Woodstock Wine and Deli's Celebration vertical last weekend. Oh well. I did win some money at poker later that evening, so maybe I'll find a way to win something this weekend and keep the streak alive. Speaking of roller derby, isn't it a shame that such a Portlandish activity is owned by Pabst and New Belgium instead of a hometown brewery? Those were the only beers for sale at the Oaks Park Derby Barn -- at least the tasty Ranger IPA was one of the choices -- maybe because they're in cans, but surely a keg of something local could be brought in. My raffle ticket earned me a 24oz bottle of 2009 Celebration at Woodstock. It was quite tasty (probably my favorite of the bunch in the vertical tasting). I keep my hopes up that eventually the Rose City Rollers will have a local beer sponsor. Just this year, Minnesota beer heavyweight Surly became a sponsor of the MNRollerGirls after year of PBR. Kris: I put that bug in Brady's ear a few weeks ago, now that he's a marketing guy for Widmer. I do think it has to do with cans; they don't want to deal with bottles or taps.